﻿Published by Sareth Ney on Feb. 17, 2017 at 6:27 p.m. Updated on Feb. 17, 2017 at 8:40 p.m.
Photo credit: The Abbey's Facebook page. ORLANDO, Fla. – iHeartRadio’s Real Radio 104.1 voting process for the 12th spot of Monsters Comedian of the Year is currently open. The winner will be revealed with the other stand-up comedians, on Feb. 22. Competitors for the 12th spot for iHeartRadio’s Real Radio 104.1 Monsters Comedian of the Year are: Elliott Gilbert, Sareth Ney, Adam Murray, Doug Lucas, Erick Feiling, Shannon Hall, Davine Ker, Kevin White, Jeff Jones, Danny Davenport, Isabel Perez, A. Ali Flores, Pablo Aleman, Ryan Holmes, Tiffany Antonescu, Vinnie Ward, Derrick Dixon, Brett Robinson, Jared Staub, Michael Herlihy, Charlie Bowie and Joey White. Voters for iHeartRadio’s Real Radio 104.1 Monsters Comedian of the Year are encouraged to view all submissions and to cast their votes for the funniest comic. The entries can be found by clicking here. Bonacci, Vic Clevigner, Ken Miller, Adam Murray, Mike Charette, Shereen Kassam, Vince Taylor, Carmen Vallone and Ross McCoy. Siebold was the winner of the first competition. In 2016, contestants for iHeartRadio’s Real Radio 104.1 Monsters Comedian of the Year included: Justin Lawson, Chris Zapatier, Naresh Adurty, Tommy O’Neill, Herlihy, Kassam, Miguel Colon, Jr., Alan Newcombe, James Yon, Ryan Holmes, Kojo Prince, Vinny D and Joey White. Colon, Jr. was the winner of the second year. Sponsors of the iHeartRadio’s Real Radio 104.1 Monsters Comedian of the Year are: Bud Light, Sunsaris and Elixir Bar Room & Hash House. For the person who earns the 12th position for iHeartRadio’s Real Radio 104.1 Monsters Comedian of the Year will participate in one of three rounds. Each will take place at The Abbey. The first round is set for March 2, the second takes place on March 16, the third is scheduled for March 30 and the finals will happen on April 13. Doors will open at 7 p.m. and the shows will start at 8 p.m. 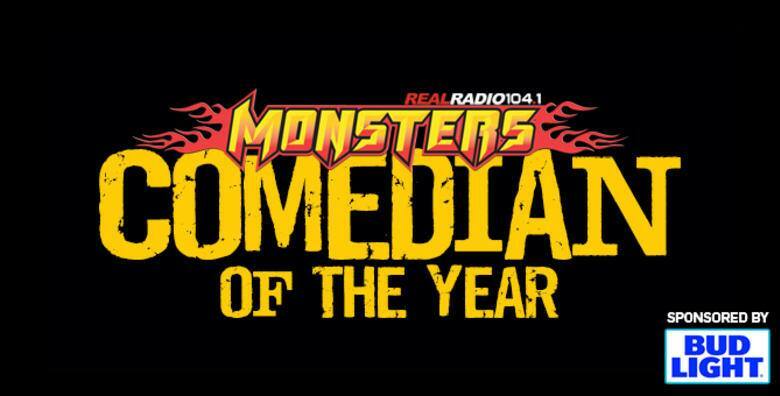 The overall winner will be crowned 2017’s Real Radio 104.1 Monsters Comedian of the Year. General admission tickets are $7 each, reserved seating are $15 and the Elixir very important person (VIP) is $50. The Elixir VIP package includes dinner and two beers. The Abbey is located at 100 S. Eola Drive in Orlando. Individual ticket to attend iHeartRadio’s Real Radio 104.1 Monsters Comedian of the Year can be purchased by clicking here.